« It’s a Bird, it’s a Plane, it’s Energy Savings for New York! 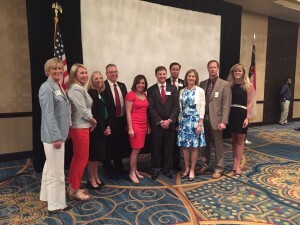 John A. Nicholson, Col., USMC (Ret), and EDF consultant (fourth from left), pictured with fellow Board members of the NC Heroes Fund, which provides grants to service members and their families who are experiencing financial difficulties as they transition from active duty back into civilian life. I cringed when I read this quote, attributed to a senior military representative in Scientific American. I understood what he was trying to say, but the sound bite could easily be misinterpreted. The Department of Defense (DoD) most certainly “does green,” and it has for some time now. At the highest level of leadership, there is recognition that energy and environmental conservation is important. The wars in Iraq and Afghanistan have reinforced and brought to the forefront the importance of energy planning and, more importantly, its use and integration by our deployed forces. Furthermore, improved energy planning and use has played a significant role in reducing costs and improving the efficiency, resiliency, and security of military bases, facilities, and other installations that prepare DoD forces for their missions. DoD is the largest federal department, and its facilities range from office complexes and small villages, to large cities complete with their own airports. Having an understanding of where energy strategy and planning fits into the overall Pentagon puzzle is essential to comprehending the department’s programs, policies, and mission to improve energy use and management. The Under Secretary of Defense for Acquisition, Technology, and Logistics (USD(AT&L)) oversees the planning, use, and management of the DoD’s entire energy portfolio. The USD(AT&L) has five Assistant Secretaries of Defense (ASD), including the Assistant Secretary of Defense for Energy, Installations, and Environment (ASD(EIE)), which is where the bulk of energy planning and management occurs. The ASD(EIE) provides budgetary, policy, and management oversight for DoD’s acquisition and use of energy to support warfighting and base operations. The enterprise encompasses energy security, increased energy efficiency, and promotion of renewable energy, and includes more than 500 installations, 562,000 buildings and structures, and 25 million acres of land. The ASD(EIE) is also responsible for managing investments in DoD facilities, Base Realignment and Closure efforts, and Environment, Safety, and Occupational Health (ESOH) activities. Operational Energy refers to energy used in military operations (such as warfighting, peacekeeping or humanitarian assistance), in direct support of military operations, and in training that supports unit readiness for military operations. Installation Energy is the energy required to power fixed installations, such as Fort Bragg, Naval Station San Diego , the Army and Air Force’s joint base in San Antonio. This includes energy provided by the local power provider and on-site energy sources. In other words, ASD(EIE) looks at every form of energy – and energy savings – available to help the military accomplish its mission. Across the board, DoD is reducing the amount of fossil fuels being used, emitting fewer greenhouse gases, and consequently producing a lower carbon footprint – because it makes practical sense. I hope renewables are recognized for making our military more capable, secure, resilient – and that “doing green” is simply the accepted norm. What is more, advancements in renewable energy have been extremely appealing to DoD for a variety of practical reasons, including but not limited to: increased efficiency, greater resiliency, enhanced economy, and, ultimately, its ability to reduce dangerous refueling missions, which put service members in harm’s way. I know what the speaker meant. The DoD doesn’t “do green” simply to “do green.” It has very important non-environmental reasons to be smart and efficient with energy. My hope is that quotes like “We don’t do green” will disappear from these discussions. I also hope renewables are recognized for making our military more capable, secure, resilient – and that “doing green” is simply the accepted norm. Renewables and clean energy solutions will continue to provide DoD new energy options, and any option that helps better accomplish its primary mission – to deter war and to protect the security of the United States – is one worth pursuing. John Nicholson served 28 years in the US Marine Corps and was the Military Affairs Advisor to two Governors of North Carolina. This entry was posted in Energy Efficiency, Military, North Carolina, Solar Energy, Wind Energy. Bookmark the permalink. Both comments and trackbacks are currently closed.